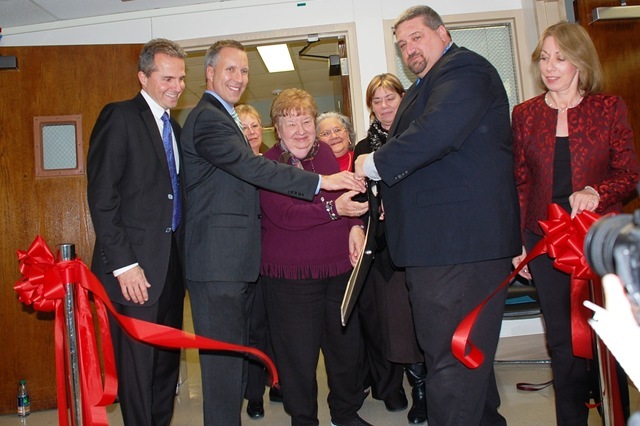 CALLICOON, NY (November 24, 2013) – On November 8, Catskill Regional’s Grover M. Hermann Hospital held a ribbon-cutting ceremony to celebrate the addition of new diagnostic imaging technology and the expansion and renovations to its Physical Therapy Department. Dr. Gerard Galarneau, CRMC’s CEO & CMO and Rolland Bojo, Vice President of Patient Services and Chief Nursing Officer assisted in the ribbon cutting. A special dedication was made in honor of Mary Cade who was a dedicated and long standing member of the Auxiliary. Digital screening mammography and bone density testing is now offered to the community. Additionally, the Physical Therapy Department more than doubled in size with renovations including new flooring, fresh paint, large windows and new equipment.